Culture is a design for living. Values are ideas about what is right and wrong, desirable and undesirable, normal and abnormal, proper and improper. Our world comprises many different cultures and accompanying values. We have witnessed and are continuing to experience major shifts in world politics due to globalization. One result of this is immigration. To participate successfully in our globalized world, we must understand the values and cultures that characterize it. Time (past, present or future). The relationship between humanity and its natural environment (mastery, submission or harmony). Human relationships (hierarchy, equality, individual merit). The primary inspiration for behavior (to express one’s self, to grow or to achieve). Human nature (good, bad or a mixture). How a society solves these problems allows us to determine that society’s values. Let us take a look at the American example. Theorist Althen identifies some key values of Americans such as individualism, equality, informality, change and progress and time. One of the greatest attributes of Americans is individualism. Engrained in their nature, Americans are trained from young to be separate individuals, responsible for themselves and the decisions they make. Not belonging to a particular group, community or any collective unit, Americans are rugged individualists. Privacy is a major value associated with individualism and Americans value time alone, since they are very independent. Equality is a key ingredient in what it means to be American. Americans live by the statement, “all men are created equal.” Another feature of the American mindset is informality (their speech, dress and body language, are very informal). Americans value technological progress, the future and change. While aware of the past and historical traditions, Americans aspire to change their environments in a positive manner, with the hopes of significant improvements. Being fundamentally good-natured is critical for Americans. Americans believe in the goodness of humanity. One of the foremost aspects of the American culture is self-help. Americans believe in education as critical to advancement. Americans believe in democratic government and volunteerism. Such traits are inherent in their individualism, freedom and equality. For Americans, time is a very valuable resource. Americans are always well organized and participate in activities geared toward saving time. Americans value people who are achievers and action-oriented. They are always on the go and can be classified as materialistic; a person’s success is based on their financial status, title, career and other possessions. Consequently, according to Hofstede’s dimensions, we can derive that America is a nation with a low power distance, since equality is the main thrust of the society. The country has a high individualism score, since they are rugged individualists. America has a low uncertainty avoidance score since they are action-oriented and highly organized. Finally, America has a low masculinity score, since all are treated equally. Based on Kluckhohn and Strodtbeck’s theory, America focuses on the present and future, they are in harmony with the natural environment, they relate to each other hierarchically as equals, the prime motivation for their behavior is to achieve and they believe that human nature is inherently good. This brings us to a discussion on immigration. Immigration has a significant impact on policymaking in the world. America can be seen as a nation of immigrants. Immigration to this nation is growing daily. Our world is now a “borderless sphere.” Places and cultures are becoming more accessible. The rapid influx of immigrants brings continuous change to the society and economy. Singer, in his article, “The Rise of New Immigrant Gateways” has discovered that one of the greatest changes brought on by immigrant populations in the U.S is settlement patterns. Immigrants are no longer concentrated in traditional areas such as Florida, California, New York, Texas, New Jersey and Illinois. Due to a modification of the job market, immigrants are in other new and emerging areas such as Atlanta, Dallas, Fort Worth and Las Vegas. Due to large-scale immigration to the United States, there is a corresponding rise in culturally distinct populations, who may not always be tolerant of or harmonious with others. This increases antagonism and leads to the formation of social movements. Yet, in spite of this, immigrants contribute to the overall economic growth of the nation. The Brookings Institution maintains that immigrants raise the overall standard of living of American workers by boosting wages and lowering prices. This is because immigrants and U.S. born workers generally do not compete for the same jobs. Instead, many immigrants complement the work of U.S. employees and increase their productivity. Another reason is that businesses adjust to new immigrants by opening stores, restaurants or production facilities to take advantage of the added supply of workers. More workers translate into more business. 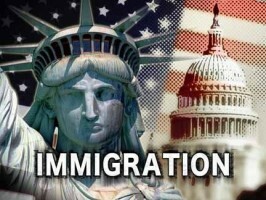 Immigration is a phenomenon that affects international and domestic populations. How can we assess this occurrence? We must examine the foreign policy interests of states, the effects that nations have on each other and the norms effected by international agreements and institutions. These will determine whether states will see immigrants as a threat, an obligation or an opportunity. Furthermore, the economy, politics and social arrangements of individual countries affect the reception immigrants receive and the contributions (positive or negative) these immigrants make. In order to address immigration, we must pay attention to differences in values and culture. Immigrants experience differences in customs, behavior and social relations. They are faced with the challenge of adjusting, adapting and cooperating. They must be integrated into their new environment and this involves an understanding of values and culture. How can we facilitate this process? By creating policies that foster the rights of migrants and improve their integration and participation in society. If we fail to do this, we create an equal threat to the values that are at the heart of our own societies, since immigration also creates problems like terrorism and illegal immigration. Additionally, our policies could incorporate language, information about the life and customs of the host society (citizenship, politics, education, finance, health, housing, laws), vocational orientation and information about immigrants’ rights. Ultimately, racial and ethnic relations in our world are changing daily. This creates a complex and competitive environment, a breeding ground for social conflict. Policymakers must be sensitive to this by understanding the importance of values and culture to our societies.